Baton Rouge, LA – Youth in East Baton Rouge Parish will join hundreds of thousands of youth across the world in leading the eighth annual 4-H National Youth Science Day (4-H NYSD) experiment. This year’s experiment, called ‘Motion Commotion,’ will combine a speeding car collision and a distracted driving demonstration in a simulated activity that investigates the physical and human factors of motion. Over 100 students from Southern University Laboratory and Park Ridge Academic Magnet Schools will conduct the two-part ‘Motion Commotion’ experiment from 9:30 a.m. – noon on October 7, 2015 at the Southern University Agricultural Research and Extension Center, 181 B. A. Little Drive. The students will use every day materials – including a toy car, modeling clay, ruler, calculator and a cell phone – to explore physics in the real-world. In the first phase of the experiment, youth will construct a simulated runway to analyze the speed, momentum and kinetic energy of a car in motion, and will explore the science behind the car’s collisions. In the second phase, they will lead an experiment that uses the same physics principles to demonstrate the consequences of distracted driving. This will include the East Baton Rouge Sheriff’s Office’s driving simulator which gives youth first-hand experience on the dangers of texting and driving. “It is important for teens to learn basic concepts related to the Science, Technology, Engineering, and Mathematics and how the subjects can be related to driving,” said Tiffany Wilkerson-Franklin, Project and Science Day Event Coordinator at the SU Ag Center. “As inexperienced drivers, learning about the importance of eliminating distractions on the highway could save their lives or someone else’s. We must raise awareness and the National Youth Science Day is a great step forward to link youth with fun, educational opportunities,” added Wilkerson-Franklin. The completed mural at St. Helena College and Career Academy as part of the SU Ag Center and the St. Helena Advocacy for Parish Enrichment's (SHAPE) Art in Public Places Initiative in the Town of Greensburg. Baton Rouge, La. – The Southern University Agricultural Research & Extension Center (SUAREC) and the St. Helena Advocacy for Parish Enrichment (SHAPE) are working together to promote the Town of Greensburg’s Art in Public Places Initiative. The partnership was develop after St. Helena College and Career Academy (SHCCA) students Javier Smith, Shy’Janae Hookfin and former student Gerald Holmes, entered the Art in Public Places Contest earlier this year. As a result of their participation all students were invited by Mr. Reginald Douglas, the Principal at SHCCA, to paint murals throughout their new school. The first phase begun on September 10th and is scheduled to continue throughout the school year under the leadership of Nicolette Gordon, Assistant Area Agent for SUAREC and Jo’el Givens, SHCCA Gifted & Talented Art Teacher. “We’re the Hawks, I would like to see a hawk breaking through and soaring out of the clouds,” said Douglas. That’s exactly the concept Shy’Janae had in mind as she and Javier worked collectively on a design that would ultimately leave their legacy behind. Story written by Nicolette Gordon, SU Ag Center Youth Development Agent. Shyheim Carter, a candidate for president of the Jag Leaders Club, holds a campaign sign before club elections at Kentwood Magnet High School on September 9, 2015. Baton Rouge, La – The Southern University Agricultural Research & Extension Center kicked-off “Club Election Day,” on September 9, 2015 at Kentwood Magnet High School in Kentwood, Louisiana. Students nominated their peers for President, Vice President, Secretary, Treasurer, Parliamentarian, iReporter and Chairman. Hopefuls were allowed to make campaign signs and give brief campaign speeches; telling why he/she is the best person for the job. “This is great public speaking practice, and gives every club member a sense of belonging to partake in the election process,” said Southern University Ag Center Youth Development Agent Nicolette Gordon. Candidates waited anxiously as all ballots were tallied to see who will lead the Outstanding Mature Girlz Club, and Jag Leaders Club during the 2015-2016 school year. “There will definitely be a leadership training for all newly elected officers,” said Gordon. Under the direction of Dr. Wanda Burke, SU Ag Center Youth Development Specialist and Director of the Southwest Center for Rural Initiatives, Youth Development Agents are currently organizing a spring “Leadership Retreat” for all newly elected Club Officers in Opelousas, Orleans, St. Helena, and Tangipahoa Parishes. 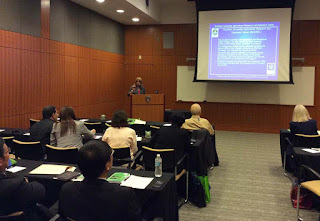 The conference sessions included functional foods in relation to obesity, neurological disorders, chronic diseases, diabetes, among others, and a panel discussion titled “Safety of the Bioactive Compounds at Efficacious Level.” More than 40 countries were represented in the conference, which ended with award and certificate presentations. Baton Rouge, La – The Southern University Ag Center has teamed up with the American Heart Association (AHA) and the Amerigroup Foundation to host the 2015 Hands-Only CPR Mobile Tour in the Capital Area on October 13 in the rear parking lot of the SU Ag Center, 181 B.A. Little Drive. The interactive training will begin with a welcome at 10 a.m. followed by 6 training sessions at 10:30 a.m., 11:15 a.m., 11:50 a.m., 1 p.m., 1:40 p.m. and 2:20 p.m.
Attendees will practice the Hands-Only method using their own CPR Anytime mannequin and will take home a kit to teach CPR skills to their family. According to the AHA, cardiac arrest is a leading cause of death with over 326,000 out-of-hospital cases occurring annually in the United States. 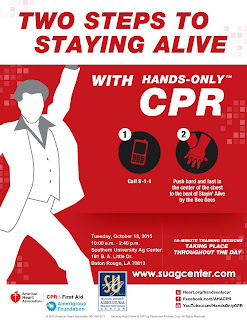 When a person goes into sudden cardiac arrest, their survival depends on receiving CPR immediately from someone nearby. Studies have shown the Hands-Only CPR method is equally as effective as conventional mouth-to-mouth CPR, and people are more likely to feel comfortable performing it. For additional information about the AHA’s Hands-Only CPR campaign, visit heart.org/handsonlycpr or youtube.com/HandsOnlyCPR. 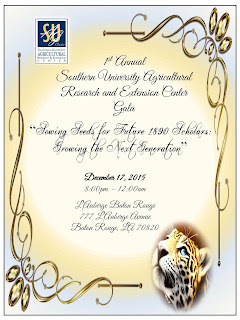 Baton Rouge, LA – The Southern University Agricultural Research and Extension Center will host a scholarship gala as part of the 1890 land-grant system’s national celebration of the 125th Anniversary of the Signing of the Second Morrill Act. The gala, themed “Sowing Seeds for Future 1890 Scholars: Growing the Next Generation,” will be held at 8 p.m. on December 17 at the L’Auberge Baton Rouge Casino & Hotel, 777 L’Auberge Avenue. All proceeds collected will be used to provide scholarships to students in the Agriculture, Family and Consumer Sciences disciplines, as well as, students participating in academic enrichment youth programs at the SU Ag Center. Individual ticket purchases are $50; tables, which seat eight, can be purchased for $400. All sponsored tables will have priority seating. The deadline for table purchases is October 31, 2015. All checks should be made payable to the Southern University Foundation. Deputy Administrator of the United States Department of Agriculture’s (USDA) Transportation and Marketing Program Arthur L. Neal, Jr. will serve as the keynote speaker for the gala. In his current position, Neal is responsible for providing leadership in marketing research and technical assistance for the department of local food systems. He also conducts economic analysis on the transportation of agriculture products from farms to stores and directs the funding of approximately $100 million in grants for local food marketing and the competitive marketing of specialty crops. He also oversees the USDA Farmer’s Market at its headquarters and the People’s Garden, a departmental effort to encourage the creation of school and community gardens across the country. He has held this position since 2011. Prior to joining the USDA’s Transportation and Marketing Program, Neal served as the Associate Deputy Administrator for the USDA’s National Organic Program (NOP), where he held a leading role in developing and enforcing national organic standards for the production, handling and certification of organic agricultural products. Neal also worked as the National Program Manager for the USDA/1890 Program and as Special Assistant to the Director of the Office of Adjudication in the USDA’s Office of Assistant Secretary for Civil Rights. Neal earned a master’s degree from the Dale Bumpers College of Agriculture, Food and Life Sciences at the University of Arkansas-Fayetteville and a bachelor’s of science degree in Agriculture Economics from Southern University and A&M College in Baton Rouge. 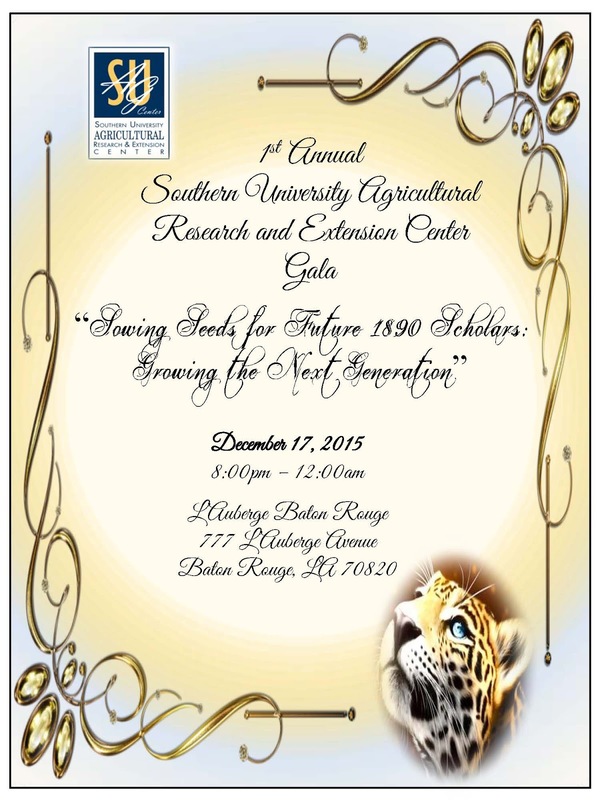 The gala will also mark the closing event of the Southern University Ag Center’s year-long celebration of the anniversary of the signing of the Second Morrill Act. For additional information or to purchase tickets, contact Linda Batiste, Kim Butler or a gala committee member at 225.771.2242. Outstanding Mature Girlz (O.M.G.) Club President Kyla Bryant pins trim to her Sustainable T-Shirt during the clubs "Fashion Fights Poverty" Workshop and Fashion Show on Sept. 12, 2015. O.M.G. Club Vice President Chritearra Brumfield brings awareness to poverty among children in Louisiana while walking the runway during the 'Fashion Fights Poverty' Fashion Show/Canned Food Drive at St. Helena College & Career Academy on Sept. 15, 2015. Greensburg, La – While the rest of the “Fashion Gods” are slaying or being spectators at many runways in New York City for Fashion Week, the Outstanding Mature Girlz Club (O.M.G.) cat walked right into the excitement! The Southern University Agricultural Research & Extension Center (SUAREC) hosted a “Fashion Fights Poverty,” Workshop and Fashion Show on Saturday, September 12, 2015 at St. Helena College & Career Academy. The club’s members learned the history of Sustainable Fashion, and designed Sustainable T-shirts. Club members were also educated about the disparities of poverty amongst their peers in Louisiana. As a result of finding out that 1 in 4 children in Louisiana live in poverty, these outstanding young ladies wanted to further their mission. Elected Club Officers hosted their first, “Fashion Fights Poverty,” Fashion Show/Can Good Drive on Tuesday, September 15, 2015 at the St. Helena College & Career Academy during their lunch shift. Students were allowed to attend the Fashion Show and pay their way forward by simply donating a canned food item. All donations will be used in gift baskets that will be donated to the elderly just in time for Thanksgiving. The SUAREC’s next Fashion Fights Poverty event is scheduled in Orleans Parish, on September 30, 2015. For more information on how you can be involved call Krystal Sugulleh, at 504. 658.2915. 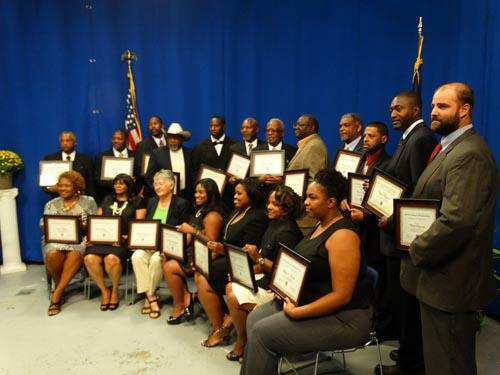 Baton Rouge, La – Nineteen participants from Louisiana, Alabama, Arkansas, Florida, Georgia, Kentucky, Mississippi, North Carolina, South Carolina, and Texas were honored during a graduation ceremony on Friday, Sept. 18 for completing their two-year course of study in the Southern University Ag Center’s Small Farmer Agricultural Leadership Institute. The graduation ceremony marked the completion of the Institute’s 5th class in its 10-year history. United States Department of Agriculture’s (USDA) Assistant Secretary for Civil Rights Dr. Joe Leonard served as the keynote speaker for the ceremony. Leonard praised the SU Ag Center’s administrators and Dr. Dawn Mellion-Patin, director of the Institute, for sharing the program with not only the citizens of Louisiana; but the Southern region of the country. Leonard went on to thank the participants for the time they invested and encouraged them to continue to learn. “We see you and honor the accomplishments that you have made. We are looking forward to greater accomplishments,” said Leonard. He concluded his speech by sharing the final words spoken by Dr. Martin Luther King, Jr. while standing on the balcony of the Lorraine Motel in Memphis, TN. After being told that one of the members of the “The Soul Stirrers” singing group was downstairs in the hotel. Dr. King said, “Tomorrow, at the next event, play (the song) ‘Precious Lord, Take My Hand’ and play it real pretty for me.” King was shot and murdered in the next instance. Dr. L. Washington Lyons, Executive Administrator of the Association of Executive Administrators presided over the program. SU Ag Center interim Chancellor Dr. Adell Brown, Jr. provided a welcome and opening remarks and Vice Chancellor for Extension Dr. Gina E. Eubanks provided the program’s closing remarks. The ceremony was also attended by Kevin Norton, Director of Louisiana’s USDA National Resources Conservation Service (NRCS) and Craig McCain, Director of Louisiana’s USDA Farm Service Agency (FSA). The Small Farmer Agricultural Leadership Institute is a two-year course of study specifically designed to guide small, socially disadvantaged, limited resource and/or minority farmers through the transformative process of becoming successful agricultural entrepreneurs. The goal of the Institute is to promote the sustainability of small family farms through enhanced business management skills and leadership development. The leadership institute has taken the majority of the participants from being just small producers through the mindset of being great producers with limited acreage, herds or holdings. The SU Ag Center is collaborating with the Southern University Law Center, Alcorn State University - Small Farm Development Center, Prairie View A & M University - Cooperative Extension Program and North Carolina A & T State University - Cooperative Extension Program to bring the Institute to the farmers in various locations. For more information about the SU Ag Center’s Small Farmer Agricultural Leadership Training Institute contact Dawn Mellion-Patin, Ph.D., director, at 225-771-3532 or visit, http://www.suagcenter.com/small-farmers. 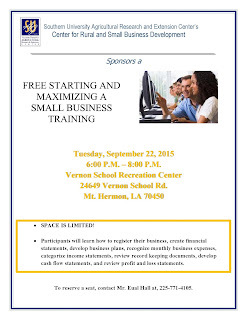 Baton Rouge, LA – Citizens in the Washington Parish area that are interested in owning a small business or already own one, there will be a seminar to enhance one’s knowledge. Eual Hall, Business Development Outreach Specialist for the Center for Rural and Small Business Development at the Southern University Ag Center, will be conducting a workshop for small business owners and interested persons on how to start a small business or maximize it. 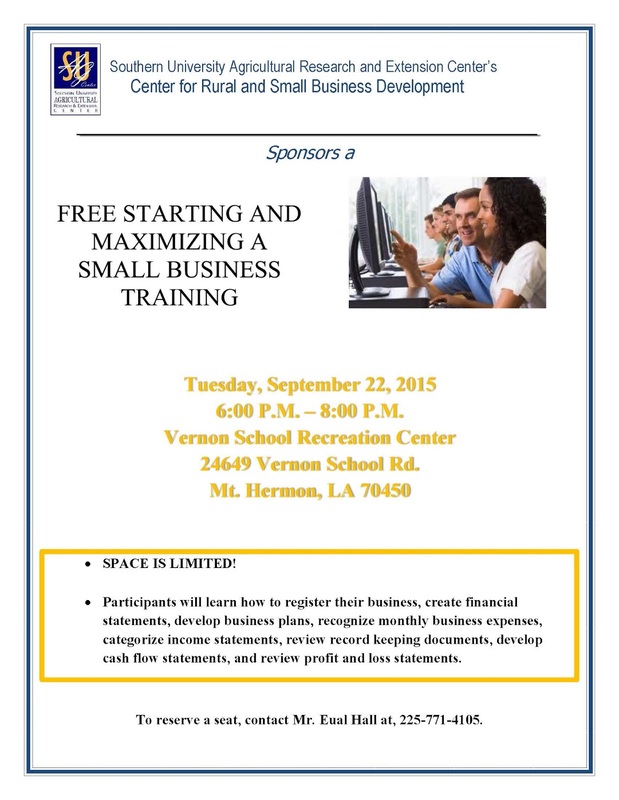 The workshop will be held on September 22 at the Vernon School Recreation Center, 24649 Vernon School Rd., in Mt. Hermon, LA. This seminar will inform participants on the steps it takes to own a small business and manage its longevity. Participants are to be at the center from promptly 6 p.m. to 8 p.m.
“It’s important for people in the Washington Parish area to come and learn how to start a business because it is essential for people to know the process of owning a small business,” said Hall. The Center for Rural and Small Business Development’s purpose is to assist those that do not know the necessary steps it takes to run a small business. The process is strenuous and it comes down to having knowledge about the business, personal goals and as well as preparation. It is a lifelong goal that is possible to achieve. Mr. Hall skips the researching phase and initiates a classroom setting so it could be taught clearly and efficiently to the many people of the surrounding area. Participants will learn how to register their business, create financial statements, recognize monthly business expenses, categorize income statements and review profit and loss statements. For additional information or to reserve a seat, contact Mr. Eual Hall at 225-771-4105 or Ms. Barbara Brumfield at 985-839-2190. Press release written by Felix Cunningham III, SU Ag Center Intern. In Louisiana, there’s always a need to be prepared for natural disasters such as hurricanes and the occasional tornado and at the Southern University Agricultural Research and Extension Center located in Baton Rouge, Louisiana, the Agricultural Center assures to prepare residents in Louisiana during September which is National Preparedness Month. National Preparedness Month or Emergency Preparedness Month’s main objective is to bring awareness and inform residents on what needs to be accomplished before, during and after natural disasters. These disasters include wildfire, floods, tornadoes and earthquakes plus the negative connotation that follows such as power outages, food shortages, and poor evacuation planning. In the Gulf Coast Region, mainly Louisiana, natural disasters involve hurricanes and the massive destruction that comes with it; examples from past destructive hurricanes such as Katrina, Rita and Gustav. The most recent was a category one hurricane named Isaac and it encompassed Louisiana on August 28, 2012 but the 600,000 residents without power and minimal death total still provided the need for preparedness. The program was jump started by a federal grant worth $5,000 from the Office of Community Preparedness before Isaac’s inception. Kelli Hollins, Family and Human Development FCS Parent Educator and Program Assistant assured that this program is for everyone in Louisiana and their wellness. “This program is instituted in all 64 parishes and our focus is on the safety of families,” said Hollins. Hollins spoke on how the seminars are beneficial towards the general public. The seminars are focused on four main points such as: how to plan your household and prepare in advance so you’re ready, signs of hazardous events that come with little warning, how to protect your household during the storm and to begin recovery after the initial disaster. Since the grant money has been dispersed it has been the responsibility of the SU Agricultural Center to increase the awareness of Emergency Preparedness Month to the state at large. Even though there has been a stint in natural disasters in the state, Hollins concludes that the program is still necessary and beneficial for the families residing in Louisiana. “Having a slump in natural disasters makes people uninterested in the program because they don’t have to be aware of the situation at the time but this is why we are here; to inform you on how to prepare for the worst case scenario,” finished Hollins. The nation at large is asking for participation during this month’s spread of events. On September 20, 2015, two representatives from the SU Agricultural Center will participate in the Department of Health and Hospital’s “Emergency Preparedness Day" at the Cortana Mall, 9401 Cortana Place, Baton Rouge, LA. The event, which will be held from 12 p.m. - 4 p.m., is being hosted as a way to inform the general public of the Metro Baton Rouge area and the state at large upon the importance of Emergency Preparedness Month. Article written by Felix Cunningham III, SU Ag Center Intern. From left, USDA Biological Science Technician Stacy Blomquist, SU Ag Center interim Chancellor Dr. Adell Brown, USDA Entomologist Dr. Brian Strom and SU Ag Center Professor of Urban Forestry Dr. Yadong Qi pose for a photo after holding a meeting on the effects of live oak gall midge on Louisiana's live oak trees. 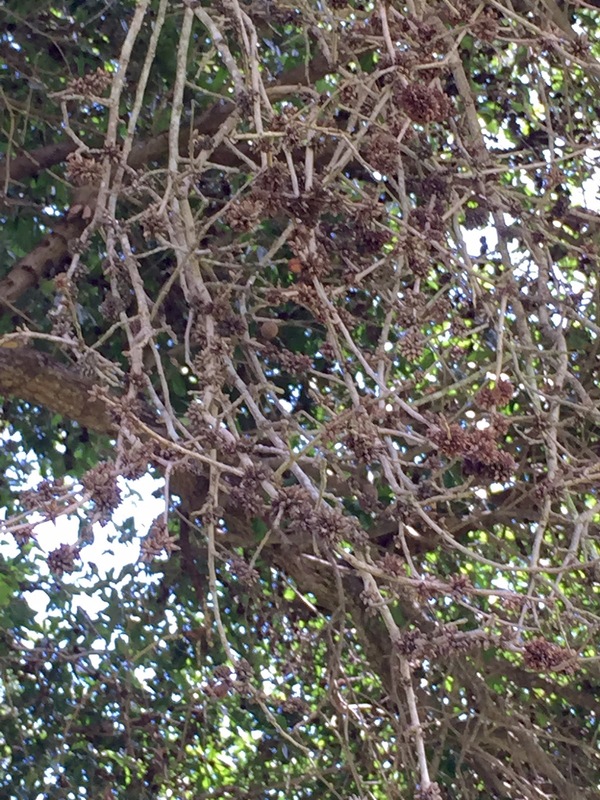 Photo of live oak gall midge clusters on an oak tree at Southern University. Baton Rouge, La – Scientists from the United States Department of Agriculture’s (USDA) Forest Service visited the Southern University Ag Center on Thursday, September 3 to discuss the emerging issue of live oak midge gall infestations and damage to live oak trees in the Baton Rouge area. Research Entomologist Dr. Brian Strom and Biological Science Technician Stacy Blomquist from the USDA’s Southern Research Station 4552 in Pineville, LA met with interim Chancellor Dr. Adell Brown, Urban Forestry Program Leader Dr. Kamran Abdollahi, Professor of Urban Forestry Dr. Yadong Qi, and Postdoctoral Researcher Dr. Vanessa Ferchaud. The infections are caused by a tiny insect called a “gall midge.” These winged pests were discovered in Texas in 1999. The gall midge lay eggs in massive budlike cluster rosette galls on the branches of live oak trees. 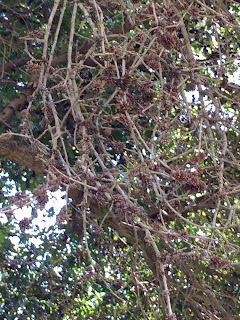 The cluster competes with the tree’s branches for water and nutrients, adding weight to the trees and eventually causes die-back of the branches and decline in the tree’s vigor. Dr. Qi believes a lack of natural predators has aided in the species becoming so invasive. Drs. Qi, Ferchaud and other SU Ag Center researchers first noticed the gall on the Southern University campus in February 2009 and began collecting data on the species. During the meeting, Dr. Qi gave a presentation detailing the current progress made by the SU Ag Center towards understanding the biology, gall formation, behavior and impact of this new pest on oak trees. The meeting provided an opportunity for the SU Ag Center to build a joint effort with the USDA to explore effective control strategies to reduce damage caused by this invasive species on our precious southern live oak tree population. For additional information on live oak midge gall, contact Professor of Urban Forestry Dr. Yadong Qi at, 225-771-4408 or via e-mail at yadong_qi@suagcenter.com. Beau Dore' speaks to middle school students during the 15th annual Back-to-School Summit in Lafayette at the Blackham Coliseum. Nearly 1,300 students from seven parishes attended the event. Southern University Admissions Recruiter Dr. Robert Rene talks to students about college admissions requirements during the Back-to-School Summit on Sept. 3. Baton Rouge, La – Almost 1,300 eighth graders from middle schools in Acadia, Allen, Avoyelles, Beauregard, Evangeline, St. Landry and St. Martin Parishes attend the 2015 Back-to-School Summit at the Blackham Coliseum on Thursday, September 3 in Lafayette. The event, which was hosted by the Southwest Center for Rural Initiatives – the Southern University Ag Center’s satellite campus in Opelousas, was held to encourage students to make better life choices, build character, think before becoming sexually active and abstain from drug use. This year’s theme was, “Are you A S.T.A.R.? Do you…Stop Think Act Review and featured a panel discussion which provided students with the opportunity to ask questions to a set of panelist. The panel included SU alum and District Attorney Steven Sumbler, Outstanding Mature Girlz Organization Founder and AIDS HEALTHCARE Foundation representative Sashika Baunchand, entrepreneur Shanna Dorion, and SU alum and Fitness Instructor Tanesha Craig. The keynote speaker, Dana “Dr. Truth” Andrus, challenged both the male and female students to grow up to be strong respectable men and women. Telling them they can overcome whatever obstacles they are facing and those obstacles don’t have to define who they will become. He also shared an emotional testimony of how he was faced with raising his special needs daughter as a single parent after his wife decided she didn’t want to be married and moved out of town with their other two children. Other speakers included SU Ag Center interim Chancellor Dr. Adell Brown, Senator Elbert Guillory, Crossroads Church Student Ministries Director Beau Dore’ and Southern University Admissions Recruiter Dr. Robert Rene. The students also received door prizes, were able to visit vendor displays and take pictures in a photo booth during the summit. An article on the Back-to-School Summit appeared in the Acadiana Bureau of The Advocate Newspaper on Sept. 4. Click the following link to view the article, http://theadvocate.com/news/acadiana/13348899-123/rural-acadiana-eighth-graders-get. Lafayette TV news station KADN FOX 15 also posted a story on their website about the event at, http://www.cajunfirst.com/news/local-news/studnets-attend-back-to-school-summit.